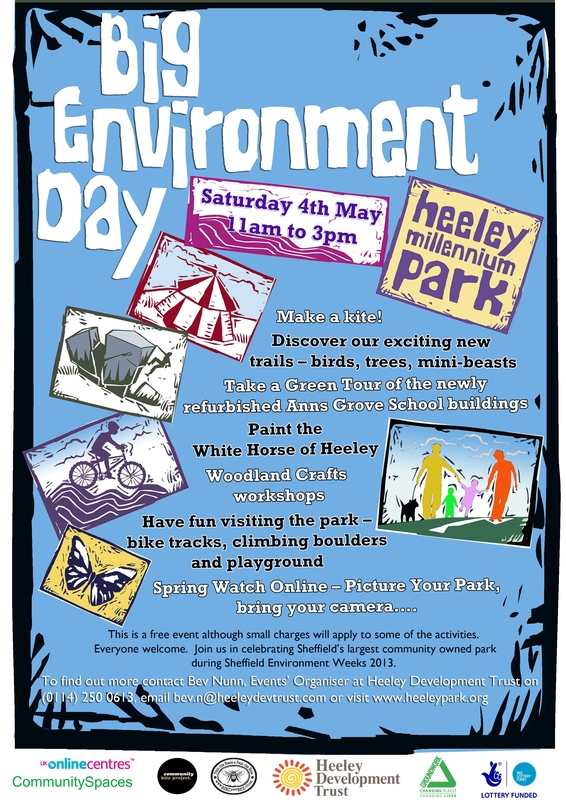 Big Environment Day @ Heeley Park – Saturday 4th May 2013 | IT'S HAPPENING IN HEELEY! Join us in Heeley Millennium Park for our Big Environment Day on Saturday 4th May 2013, 11am to 3pm. There’ll be eco activities for the whole family to enjoy, free of charge. Choose from woodland crafts, discover our new bird, tree and mini beast trails, or give us a hand painting the White Horse of Heeley (old clothes essential!). Bring along your camera to take part in our Spring Watch Online session and join us for the first public tours of Sum Studios (the newly refurbished Anns Grove School building). The Heeley Institute will be open for kite making workshops with the folk from Community Kite Project, and hot drinks and a range of snacks will be available to buy on the day. Come and join us in celebrating the fantastic new features in the park, built and looked after by Heeley Development Trust, and find out more about how you can be involved in helping out with it’s upkeep or with festivals and events taking place this year.